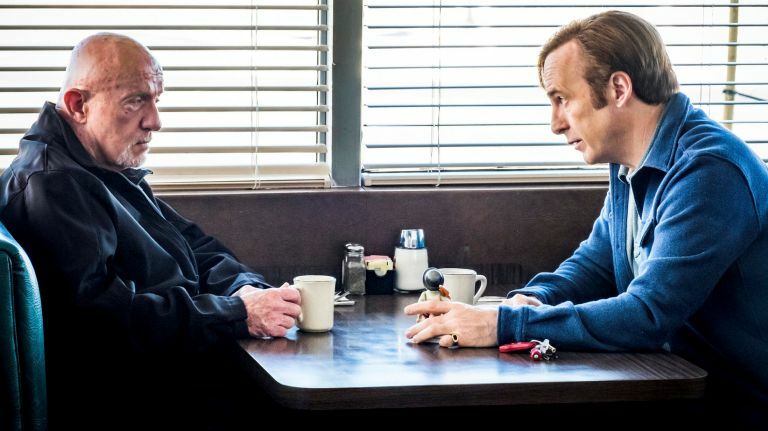 Let’s welcome back the first rate “Better Call Saul” (AMC, 9 p.m.) as Jimmy gets closer to the persona he was on “Breaking Bad” (and we continue to glimpse the person he became after). For right now, he has to deal with the fate of his brother, while Mike takes on a new task in the fourth season premiere. Becca picks a partner on the finale of “The Bachelorette” (ABC, 8 p.m.), set in the Maldives, which all told goes on three hours. Will she pick the bigot Garrett or the equally bland Blake? A second season starts for the British import “No Offence” (Acorn TV, streaming) on the British streaming service, starring Joanna Scanlan as quirky investigator Vivienne Deering from Paul Abbott (“Cracker,” “State of Play”). In the documentary “Still Tomorrow” on “POV” (PBS, 10 p.m., check local listings), we meet Yu Xiuhua, a woman with cerebral palsy who is also the best-selling poet in China. “Kids Baking Championship” (Food, 9 p.m.) starts its fifth season, with young chefs making selfies in their eclairs. The top 10 are revealed on “So You Think You Can Dance” (Fox, 8 p.m.). On the second episode of “Rest in Power: The Trayvon Martin Story” (BET, 10 p.m.), a local killing becomes a national story. Thirty qualifiers compete in the Indianapolis city finals on “American Ninja Warrior” (NBC, 8 p.m.). Darius tries to get revenge on the hackers in “Salvation” (CBS, 9 p.m.). A detective is victim of a bio-terrorism attack on “Elementary” (CBS, 10 p.m.). Piano shopping is part of “Counting On” (TLC, 9 p.m.). “Teen Mom 2” (MTV, 9 p.m.) begins its reunion episodes. “Imagine (Magic) Dragons” is the title of tonight’s episode of “Penn & Teller: Fool Us” (CW, 8 p.m.). Jeff Davis is guest on “Whose Line Is It Anyway?” (CW, 9 p.m.). On “Floribama Shore” (MTV, 10 p.m.), Candice cancels a date with Codi after talking to her boo-thang. Tamra broke her foot on “The Real Housewives of Orange County” (Bravo, 9 p.m.). A hunting trip turns sour on “Southern Charm Savannah” (Bravo, 10 p.m.). “Man v. Food” (Travel, 9 p.m.) takes on Indianapolis. The MGM contract player Audrey Totter is featured all day on Turner Classic Movies with “The Sailor Takes a Wife” (6 a.m.), “The Postman Always Rings Twice” (8 a.m.), “The Cockeyed Miracle” (10 a.m.), “The Beginning or the End” (11:30 a.m.), “Any Number Cn Play” (1:30 p.m.), “Men in the Dark” (3:30 p.m.), “The Sellout” (5 p.m.), “The Set-Up” (6:30 p.m.), “Tension” (8 p.m.), “High Wall” (10 p.m.), “Lady in the Lake” (midnight), “The Unsuspected” (2 a.m.) and “Chubasco” (4 a.m.). It’s Yankees at White Sox (ESPN, 8 p.m.) in Monday Night Baseball. The Soccer women’s under-20 World Cup has Nigeria vs. Germany (Fox Sports 2, 720 a.m.), Paraguay vs. Spain (Fox Sports 2, 10:20 a.m.) and U.S. vs. Japan (Fox Sports 2, 1:20 p.m.). A couple of southeast region semifinals help heat up the Little League (ESPN2, 7 and 9 p.m.). The WNBA has Seattle at New York (NBA, 11 a.m.). And the Tour of Utah (Fox Sports 2, 3:30 p.m.) prepares to begin. Kelly Ripa and Ryan Seacrest: Alyssa Milano, Craig Bierko, Alice Merton, Leslie Bibb. The View: Joel McHale, Daveed Diggs (rerun). The Talk: Tyra Banks, Carolyn London, Big Boy (rerun). Harry Connick: Jaimie Alexander, Kristen Kish, Charlamagne Tha God (rerun). Steve Harvey: Kimberly Caldwell-Harvey, Evelyn Lozada, Terri Seymour, Arthur Glosman, Liz Kennedy (rerun). Ellen DeGeneres: Alden Ehrenreich, Donald Glover (rerun). Wendy Williams: Nicole Byer (rerun). The Real: Shaun T (rerun). Stephen Colbert: Chris Hayes, Rob Corddry, Regina Spektor. Jimmy Kimmel: Justin Bateman, Becca Kufrin, Meghan Trainor. Jimmy Fallon: Glenn Close, Finn Wolfhard, LAUV. Seth Meyers: Lester Holt, Alicia Silverstone, Bryce Vine, Joey Castillo. James Corden: Keanu Reeves, Peter Stormare, LANY. Carson Daly: Bobby Lee, Jungle, Travis Fimmel (rerun). Trevor Noah: Stacey Abrams. Conan O’Brien: Amanda Peet, Daniel Cormier, Steve Cropper, Benjamin Booker (rerun).